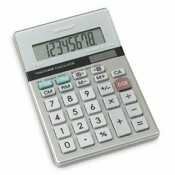 Portable LCD calculator for either handheld or desktop use. Runs on both solar and battery power. Automatic shut-down if not used. Portable LCD calculator for either handheld or desktop use. Runs on both solar and battery power. Comes with operating battery. Automatic shut-down if not used. Display Angle-Adjustable Display Digits-8. Digit Height-15mm. Memory-4 Key. +/- Switch Key. Tax Function. Size-3.9w x 5.8d. Replacement Battery-DURD389/390B (sold separately).